Catching up with my reading and a few days ago finished the Stagger Lee graphic novel from writer Derek McCulloch and artist Shepherd Hendrix. First published by Image Comics in 2006, (see its original official website here), its a strange enjoyable but ultimately flawed read. Telling an American tale of Christmas Eve, 1895 in St. Louis, Missouri, Lee "Stack Lee" Shelton shot and killed Billy Lyons during an argument at a bar. Said argument may or may not have been triggered by a stetson hat. But the story told here is not so much about the shooting but the legend it gave rise to. If like me, you think you recognise the 'Stagger Lee' name but not the story its probably because of the song versions it inspired. Most noticeable for me the Nick Cave version which has a great beat but probably the most explicit lyrics around! (For a comprehensive insight into the 'Stagger Lee' story and the 'Murder Ballads' it inspired, checkout Paul Slade's articles and website here). The graphic novel expertly traces the orgins of the various versions of the songs which include not just Nick Cave but Bob Dylan, The Clash, The Grateful Dead, Wilson Pickett and dozens more, handily listed in the book's appendix. 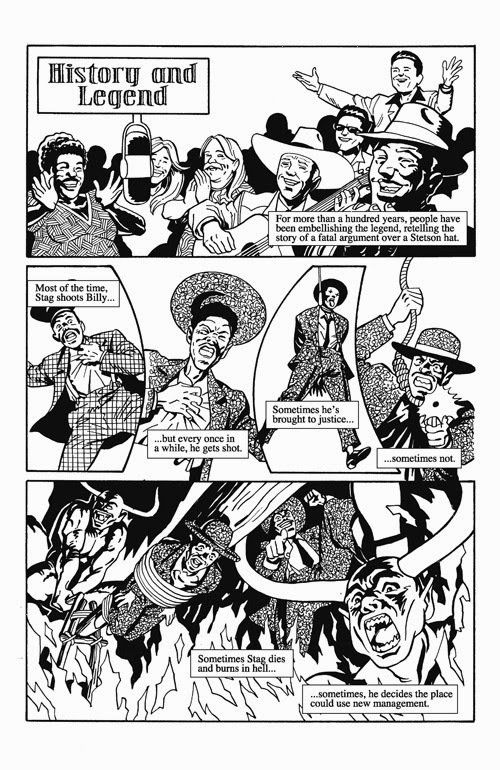 It cleverly highlights the different version of events relayed in the songs which artist Hendrix has a lot of fun with - at one point drawing the main characters in each others distinctive suits to illustrate doubts who the real protagonist was! The story of the songs and the basic known facts of the case, (based on a true story) would probably make for a satisfying read in itself. 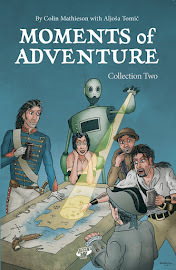 However the book has a further layer to it with regular vignettes from a supporting cast, some real, mostly fictional. These are actually well told on the whole, albeit sometimes confusing to recall who's who and how they fit into the scheme of things. In my view though these episodic vignettes detract from the Stagger Lee story too much and jar with the courtroom scenes and song interludes. The fictional element would perhaps have made for a valid separate book in itself rather than 'shoehorn' it in here. Ultimately making for Stagger Lee to be a laboured read in parts but still worth picking up if you come across it. I contrast this with the Johnny Cash, I See A Darkness, graphic novel by Reinhard Kleist (Self-Made Here 2009), which I also recently read for the first time. It also juggles song lyrics with factual biography but cleverly keeps things moving without the need to add extra fictional elements and makes for a more entertaining read in my humble opinion. 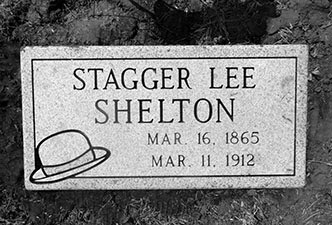 Still, Stagger Lee was, (as the songs convey), a bad, bad man and his story endures to this day. A fact brought home when I noted the date I finished reading this graphic novel, the 11th March, which just happens to be the anniversary of Lee 'Stack Lee' Shelton's death in the Missouri State Penitentiary Hospital in 1912!